Taking forward the National Plan of action to implement the Recommendations’ of the Lessons Learn and Reconciliation Commission. The power point presentation contents of the secretary to the President Lalith Weeratunga, which was presented to 70 + diplomatic missions based in Geneva on 21 January 2014. Commission of Inquiry to investigate alleged abductions or disappearances of persons resident in the North and East. Census on deaths/injuries to persons or property damages due to conflictssince1982. Army Courts of Inquiry into (a) allegations with regard to civilian casualties; (b) allegation of summary executions of captured persons. 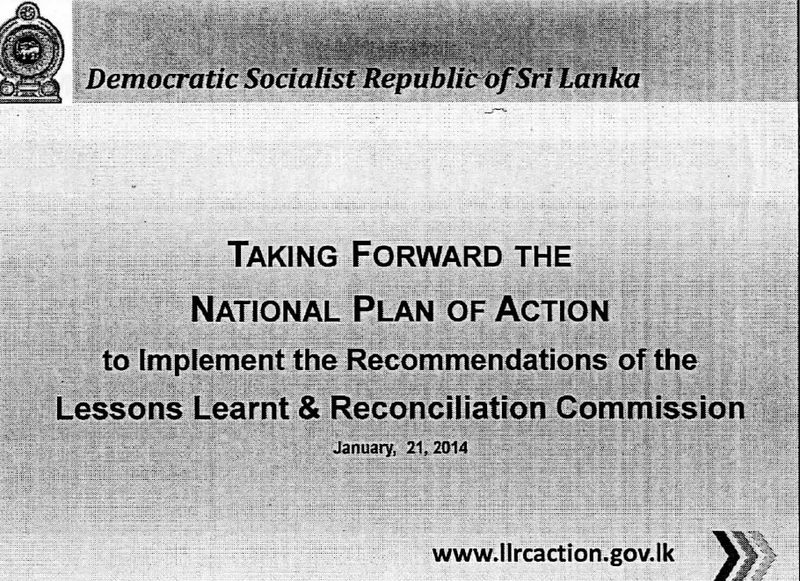 Collaboration between GoSL and ICRC on matters relating to alleged disappearances. Team of prosecutors reviewing material available. Criminal Investigation Department is conducting further investigations. Collaboration between GoSL and ICRC on matters relating to remaining 188 detainees, including spot visits. Ail 594 LTTE Child Combatants have been rehabilitated and reunited with their families within one year. 11,872 ex-combatants have been rehabilitated and reintegrated into society. Only 171 remain in rehabilitation following legal proceedings. Special Circular issued by the Land Commissioner General to facilitate resolution of land issues in North and East. Land release • 20,001 acres of private land and 5,740 acres of state land in the North and East formerly used by the military have been released. High Security Zones which prevailed during the conflict period no longer exist. Military cantonments remain in place to ensure national security in identified locations. Civilian administration is now fully restored in the former theatres of conflict. Military presence in the Northern Province: Substantial reduction in the area occupied by the security forces. Number of security barricades, road blocks and checkpoints in the North and East reduced by 99%. Reduced by 30% of its peak levels during conflict. Continuous evaluation of the security requirements being made to facilitate further reduction of troops. Implementation of the Trilingual Policy. Integration of youth in reconciliation. HR education and reconciliation through school curricula and tertiary education. Recruitment of 665 Rehabilitated LTTE members to the Department of Civil Security. Promotion of ethnic and cultural harmony through sports and the arts. Over 96% of the area demined. Currently, only 86 sq km remain to be cleared from a confirmed hazardous area of 2,061sq km. 297,000 persons housed at Menik Farm welfare village immediately after the conflict in 2009 are now fully resettled. Menik Farm Welfare Village was closed on Sept, 24, 2012. Action taken to expedite remaining 7,094 IDP fameless in the North and East. Of this, 5,585 are staying with host families. GoSL is taking action to provide durable solutions to protracted IDPs, including Muslim IDPs. From 2010 to 2012, Rs 392 M has been provided for the payment of compensations. Rs 204 M was provided as compensation in 2013. Courts are now fully functional in many parts of the Northern Province with the exclusive use of Tamil Language.